NEW YORK (KABC) -- The NBA has decided to relocate its 2017 All-Star Game from Charlotte, N.C. because of that state's legislation that the league believes discriminates against the LGBT community. "Our week-long schedule of All-Star events and activities is intended to be a global celebration of basketball, our league, and the values for which we stand, and to bring together all members of the NBA community - current and former players, league and team officials, business partners, and fans," the NBA said. "While we recognize that the NBA cannot choose the law in every city, state, and country in which we do business, we do not believe we can successfully host our All-Star festivities in Charlotte in the climate created by HB2." The law, HB2, removes certain protections for lesbian, gay, bisexual and transgender individuals and requires that restrooms can be used only by genders identified on a person's birth certificate. That has been controversial because it does not allow transgender people to choose restrooms that correspond to the gender with which they identify. Facing national pressure, state lawmakers recently revisited the law, but left it mostly unchanged. The NBA is still looking for a new location for February's weekend of All-Star events. 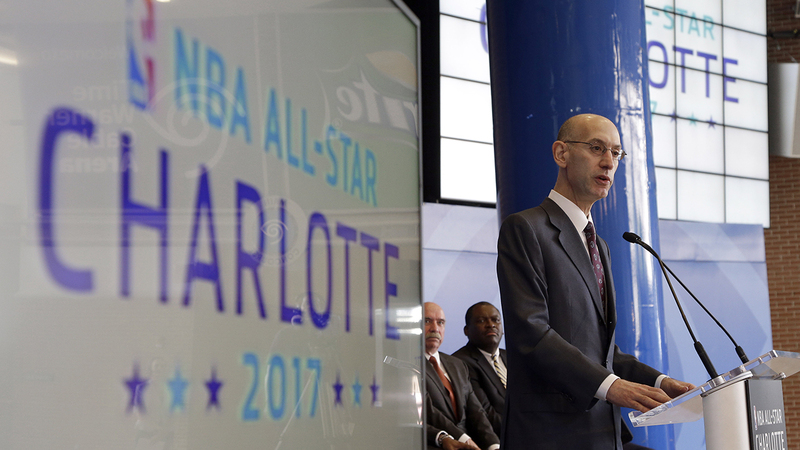 The league said it hopes to hold the All-Star Game in Charlotte in 2019 "provided there is an appropriate resolution to this matter." The NBA noted that Charlotte's franchise, the Hornets, have been inclusive in their own activities and treatment of the LGBT community. "It is also important to stress that the City of Charlotte and the Hornets organization have sought to provide an inclusive environment and that the Hornets will continue to ensure that all patrons - including members of the LGBT community - feel welcome while attending games and events in their arena," the league said. Hornets chairman and Hall of Famer Michael Jordan said the now-former host team understands the league's decision. "We understand the NBA's decision and the challenges around holding the NBA All-Star Game in Charlotte this season," Jordan said. "There was an exhaustive effort from all parties to keep the event in Charlotte, and we are disappointed we were unable to do so. With that said, we are pleased that the NBA opened the door for Charlotte to host All-Star weekend again as soon as an opportunity was available in 2019." Jordan vowed to restore interest in the Hornets when he took over as the franchise's majority owner in 2010. He had hoped that hosting All-Star game would be another step in putting the franchise back on the map. "It's a constant process to get back to the top," Jordan said on June 23, 2015, at a ceremony in downtown Charlotte. "At one point this team was on top. And we took a long fall." The Hornets have fought through some tough seasons - including a 7-59 campaign - but have been to the playoffs twice in the past three seasons although they have not advanced out of the first round. NBA Commissioner Adam Silver has said having Jordan, one of the NBA's most recognized figures, in Charlotte was one of the draws for the league to have the All-Star Game in Charlotte. "I give him an 'A' for all of the things that he is doing in the community," Silver said. "We wouldn't be bringing an All-Star Game to Charlotte if we didn't think he was an A-level performer in terms of management of a franchise." When the Hornets submitted their All-Star bid the city had agreed to pay about $30 million in renovations to the arena. Silver had said he was pleased with the Hornets plans that had been made for renovations, which included upgrading the infrastructure, suites and scoreboard - all of which have been completed or are close to being completed.